1. 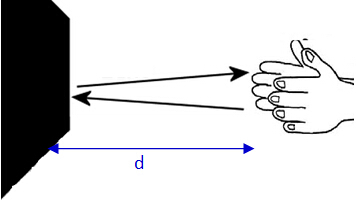 Measure a distance d from person A to person B in an open field using measuring tape. 2. Person A fires the pistol. 3. Person B starts the stopwatch when he sees the flash of pistol and stops it when he hears the sound. The time interval t is recorded. 4. Using speed = d / t , we can calculate the speed. Exchange the positions of the person A and B and repeat the experiment. It will reduce the effect of wind on the speed of sound in air. Repeat the experiment several times and take the average value of the time intervals recorded to calculate the average speed of sound. 1. Measure the distance d from the wall to the clapper in an open field using measuring tape. 2. Make a sharp clapping sound and repeat the sound at regular intervals to coincide with the echoes. In other words, the second clap coincides with the echo from the wall from the first clap. 3. Start counting the clap at zero as the stopwatch is started, count the number of claps and stop the stopwatch at 50 claps. 4. Repeat step 3 to find the average time for 50 claps. Hence, calculate the time interval t between claps. 5. Using speed = 2 d / t, we can calculate the speed.